Is This Cancer Drug Really a Vaccine? What's the first thing that comes to mind when you hear the word "vaccine?" The first thing I think about is the flu shot (that I probably should have gotten a few months ago), but you might also think about Jonas Salk's revolutionary polio research or smallpox, which was the first disease to be targeted with a vaccine. All of these are valid answers, and reinforce the concept that these drugs prevent you from getting sick. Take, for instance, biotech company Dendreon's FDA-approved prostate cancer drug Provenge. This medicine is often referred to as a "vaccine" - but does it actually prevent or treat cancer? And, looking at this company as an investor, is there a market for this type of medicine? The types of vaccines that we usually hear about are preventative in nature; these injections actually expose your body to inactive particles of specific viral strains. Then, when a live virus really tries to invade the body, your immune system is able to quickly recognize it, and has antibodies to fight off the infection. Merck's Gardasil is an example of a preventative cancer vaccine. This drug is able to protect against four types of the human papillomavirus (HPV), which is the leading cause of cervical cancer. The drug reached a massive $1.6 billion in sales in 2012, and Merck also has another vaccine in clinical development, called V503, which should expand protection to four more types of HPV. However, "vaccine" is really a general term that covers any agent that activates the immune system. Dendreon's Provenge actually treats a disease, so it's more accurate to call it a therapeutic vaccine. This treatment is meant for patients who have already developed metastatic prostate cancer and haven't responded to hormone therapy. Remarkably, Provenge is made using the patient's own immune cells; clinicians take these cells, and basically mark them with antigens that make them look like prostate cancer cells. Later, when the modified cells are infused back into the patient, the body's immune system is able to detect these markers, and is also able to identify and fight tumors. A way to conceptualize this complex process is to think of the immune system as a police dog tracking a criminal on the run -- officers give the dog a piece of clothing that smells like the convict, and the trained canine is then able to follow the criminal's trail. Dendreon's drug is certainly innovative, and was the first therapeutic cancer vaccine to win FDA approval; but science is one thing, sales are another. 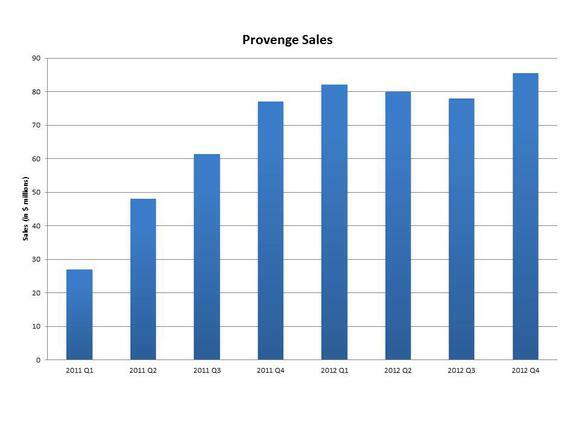 Let's take a look at the revenue Provenge generated in the first full years following its FDA approval. Source: Company 10-Q filings and press releases. Slow growth resulting in total net revenue of $213.5 million in 2011 may seem like a successful year for a fledgling biotech, but it was a dismal failure when you consider the company's lofty projections. Guidance for Provenge heading into the year was between $350 and $400 million, and Dendreon's management had such high expectations for the drug's widespread adoption that it expected between $175-$200 million in revenue for the fourth quarter alone. Results in 2012 were marginally better, with total revenue reaching $325.3 million, but sales stalled in the second and third quarters. So why has such an innovative therapy failed to become a blockbuster? Part of the reason is the high price tag associated with the treatment --estimates place it at $93,000 per year for one patient -- and, looking forward, Dendreon will also have to deal with a changing competitive environment. Johnson & Johnson's oral drug Zytiga was previously approved for the treatment of prostate cancer patients who had already used chemotherapy. However, toward the end of last year, the FDA expanded the use of the drug for metastatic castrate-resistance prostate cancer patients who have not yet tried chemotherapy -- which put it in direct competition with Provenge. Dendreon's earnings conference call last week failed to offer investors long-term confidence, and management is expecting lower sequential sales for the first quarter of this year. This stock's massive 80% drop in the last two years underscores the significant challenges Dendreon faces, and it remains to be seen if revenue will ever pick up. Resurgence, or dead cat bounce? 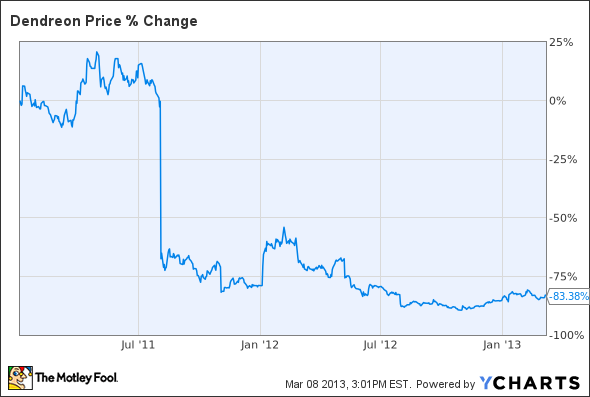 Shares of Dendreon have surged in recent months, with the stock gaining new life from the depths of late 2012. Has the company really solved its underlying problems, or are investors setting themselves up for more disappointment? Our new premium research report on Dendreon answers these questions, and many more, while also outlining just how Dendreon intends to regain its former glory. Claim your copy by clicking here now. The article Is This Cancer Drug Really a Vaccine? originally appeared on Fool.com. Max Macaluso, Ph.D. has no position in any stocks mentioned. The Motley Fool recommends Johnson & Johnson. The Motley Fool owns shares of Dendreon and Johnson & Johnson. Try any of our Foolish newsletter services free for 30 days. We Fools may not all hold the same opinions, but we all believe that considering a diverse range of insights makes us better investors. The Motley Fool has a disclosure policy.